The only things guaranteed when sailing the Seven Seas are unforgettable adventures and epic battles. 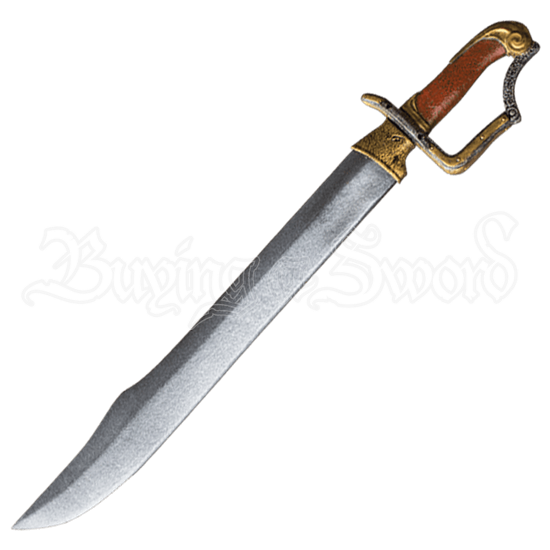 Adventurers who prefer the salty air of the ocean to that of an enchanted forest will put the Seafarer Short LARP Sabre to good use. An experienced explorer will find delight in the curved blade and golden accents of the hilt. A quillon extends from the end of the blade to the pommel, supporting a firm grip and aiding in a powerful strike. Made from closed-cell foam around a solid fiberglass core and Blade finished with a latex coating, this seaworthy sword suits the image of a bold buccaneer. This latex-hybrid weapon is approximately 23.6 Inches in overall length. This measurement will vary as each LARP sword is a handmade item. Latex-hybrid weapons are more durable than standard latex LARP weapons, but they still need to be maintained to a certain degree. The hilts are relatively maintenance free. To care for the blade, we offer a Maintenance Silicone (MCI-2000) that can be purchased separately in the LARP Accessories section. We recommend that you use this silicone on a regular basis to treat the blades of these latex-hybrid weapons. It has an easy, spray on application, and it will keep the latex coating on the blade flexible, extending the life of the weapon. The maintenance silicone also helps the weapon resist general wear and tear from normal use. Measurements will vary as they are handmade items.